How many times have you spent New Year’s Eve watching the countdown and fireworks from the comfort of your home? Let’s put an end to that this year. But this isn't about putting on a fancy dress and heading to an expensive gala. Instead, why not stay in your comfy clothes (they’ll be covered by your winter coat anyhow), and grab a spot for an outdoor firework show? It may be chilly outside without your champagne flute but a display of fireworks against a backdrop of snow is definitely something to see. Some events are even kicking it up a notch with new traditions like the Maple Leaf Drop in Ottawa. From the West Coast to the East, there's no shortage of countdown and spectacular fireworks, with many events offering free admission and family-friendly activities (sometimes even including early countdowns for the little ones). All you’ll need is a warm coat, gloves, a hat and you’ll be ready to ring in 2014 with a bang. And if you’re in the mood for a dance party while trying to stay warm (and awake) until midnight, you can count on DJs and musical performances by Canadian artists at most venues to keep things going until those final seconds. 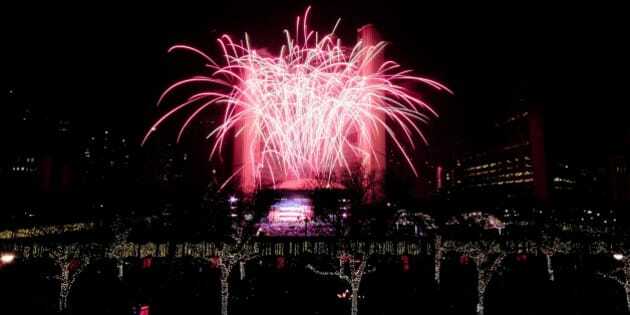 So, let's bring in the new year with 13 of the best places in Canada for amazing NYE fireworks shows. Does your hometown put on a fireworks show that didn't make it on the list? Let us know in the comments!